Barnaby Benson on copywriting: What’s Shakespeare got to do with brand writing? What’s Shakespeare got to do with brand writing? As someone who likes books, has an English degree and makes a living from writing, I get asked who my favourite authors are a lot. There are too many to mention them all. But here are four, along with some thoughts on what they have taught me about writing for brands. "All our words from loose using have lost their edge." 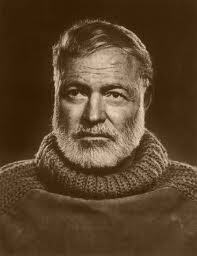 At his best, in short stories such as Indian Camp, Big, Two-hearted River and The Snows of Kilimanjaro, Hemingway’s economic, repetitive style suggests the emotions of the characters without making them explicit. Because so much is left unsaid, the reader senses the epiphany as if the significant moment was happening to them. You are being given the information: you are not told how to feel. A great lesson. If you provide the evidence for a claim, sometimes, if it’s powerful enough, you don’t need to make the claim itself. The audience will discover it for themselves. Whenever you are asked to write a positioning statement for a brand, define a new mission statement, or write a CEO’s review of the year for an Annual Report, it’s good to try to work in a little metaphor here and there. Abstract ideas become easier to grasp if they are made material. Sentiment: ‘Exaggerated and self-indulgent feelings of tenderness, sadness, or nostalgia’ (the OCD again). Feelings are rather frowned upon in business. Yet if you avoid stimulating the feelings of the consumer you won’t get very far. When I was growing up, a BMW press ad dedicated over 90% of its layout to a beautiful image of the car that made you want it. And there’d be a quirky headline. This stimulated desire. Now the ads bludgeon you with technical statistics and then tell you the car will make you feel joy. Er, I need to feel it to believe it. Salinger’s alienated first person narrators trying to figure out what they feel about things make you feel things as they do. Create emotion: don't claim it. ‘The stimulus that led Mr Camus to write this well-meaning but maddeningly woolly and verbose essay is his horror at the spectacle of our era…’ p498 Prose Volume 3, Faber and Faber. After a few more lines he explains why the French are so forgiving of communism (‘However horrified they may be morally, they cannot help feeling that to be against any revolution is reactionary and un-French'). This combination of intellect and blunt talk is thrilling because the brilliance of the insight is always laid bare. A useful lesson: when you have something worthwhile to say, say it in simple language. One could go on. All great writers are dealing in truth. Perhaps that’s the most important lesson of all. Message first: then the writing.